Hey! Put your dog on a leash. Pretty sure that’s what you’d hear when you take your dog to the park or for a stroll. But that’s old school don’t you think? I mean, who uses leashes anymore? Pets these days are cute, and it would be uncomfortable for the pet and inhumane to put a pet on a leash when you could just put it in a stroller. If you want your pets to know you love them, why not show it to them; pamper and take care of them, and give them the best ride, sorry, stroller!. Do You Need A Jogging Dog Stroller? When Do You Need A Jogging Pet Stroller? What Type Of Jogging Pet Stroller Is the Best? What To Look Out For In Jogging Dog Strollers? How We Choose Our Best Picks? If you have a dog or a pet and you want to take it for a jog, Jogging strollers are ideal for places that are rough and dirty. Also if you are going to a place with a smooth or plain surface, then you can use the old and commonly used jogging strollers; no muss no fuss. But a jogging stroller to tackle on dirty routes. Do you have a pet and love your exercise but you don’t want to lose any precious time, and you also don’t have spare cash to pay a sitter? Then you need a jogging stroller. When you want to jog with friends, or on your own, you could take your pets out with you in the stroller. There are several jogging Pet strollers that are suitable for outdoor exercises. There is two or three-wheel jogging stroller that comes with a leash, which protects the dog from falling out. There are other kinds of stroller perfect for bicycles. Pick a stroller that suits your outdoor exercise. Your jogging stroller should have a zipper option, so you can quickly put in and take out your pet. It should have enough room and be able to accommodate a dog of 30 – 60 pounds. A three tire feature, for stability. A mesh cover for protection from harsh weather conditions, and also for the free flow of air. To ensure that we bring you quality and reliable product, we look out for the jogging stroller that has the highest number of purchases, customer reviews, and comments. We also look at the specs and design of the jogging stroller; it has to be sturdy, yet fashionable to flaunt around. This convertible stroller pushes the boundaries of innovation in the stroller business. Rather than steel, the stroller is made of an aluminum alloy, which makes it a whole lot lighter and more comfortable to carry, and still durable enough to accommodate a 30pound dog conveniently. There is a reflective strip on the stroller to eye your pets. Among other features are the water bottle pouch, and a side zip window for protection from weather elements. This stroller is the equivalent of the heavy-duty vehicles; only it’s for a pet. A stroller that can hold two pets or even one large pet is indeed something. With a foamed tire, it is impossible for you to complain about a flat tire. The g7 stroller has other attractive features that will blow your mind. Feel like taking a ride with your pet, then the 2 in 1 Dog Stroller & Bicycle Trailer is the right choice for you. It is a convertible stroller, with a reflector and handbrake. You don’t have to worry about bending over to see what your pet is doing; the visibility reflector helps you keep an eye on it. Imagine being caught in an emergency situation while taking your pet on a stroll, in your zipped stroller, and you don’t have enough time to take out your pet or roll it out of the way, what then do you do? Nothing, you can do nothing. That is why the producers of this product have made this product so that you can quickly get your pet out and put it in the stroller no fuss. This is its outstanding feature. When picking out the stroller that is perfect for your use, we think safety. So that, irrespective of the kind of exercise, you rest assured that your pet is safe from bumps and injuries. That is why the compartment inside is made of foam, for maximum comfort and safety. You can find even dog strollers created for your jogger! It’s possible to run together inside your stroller as your puppy relaxes. This kind of puppy prams tends to have three wheels, two in the front and one wheel at the front side. This style of stroller will cope with lumps because of the added suspension at the wheels and offers maneuverability compared to the four pushchairs. Running strollers also have some helpful storage place for keeping to water bottles, cellular phones, mobile phones and treats to the dog. Your pet will stay secure in the stroller since they include leash clip attachments, and that means you can jump out. 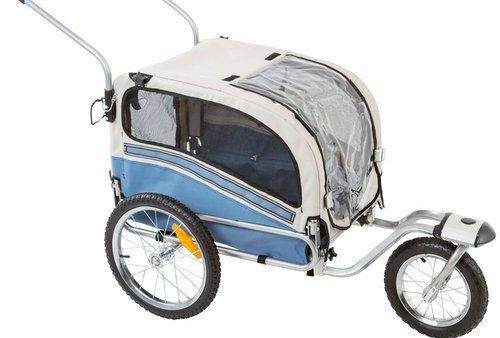 If you love cycling, then keep an eye out for your running strollers which may be connected to a bicycle and eventually be a secure and safe bicycle trailer for the dog. Choose the Right Choice and Get the Best Dog Stroller For Jogging in 2019.